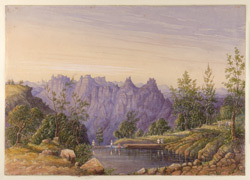 Water-colour painting of a stream in the Western Ghats by William Robert Houghton (1826-1897) c.1878. The Western Ghats run from Gujarat in the north to the southern tip of India, parallel to the Arabian Sea coast, covering an area of 160,000 square kilometres. The mountains intercept monsoon rain clouds which move in from the west and as a consequence are covered with dense green forests including the only rainforests in southern India. Many of India’s most important rivers such as the Kaveri and have their source in the mountains.